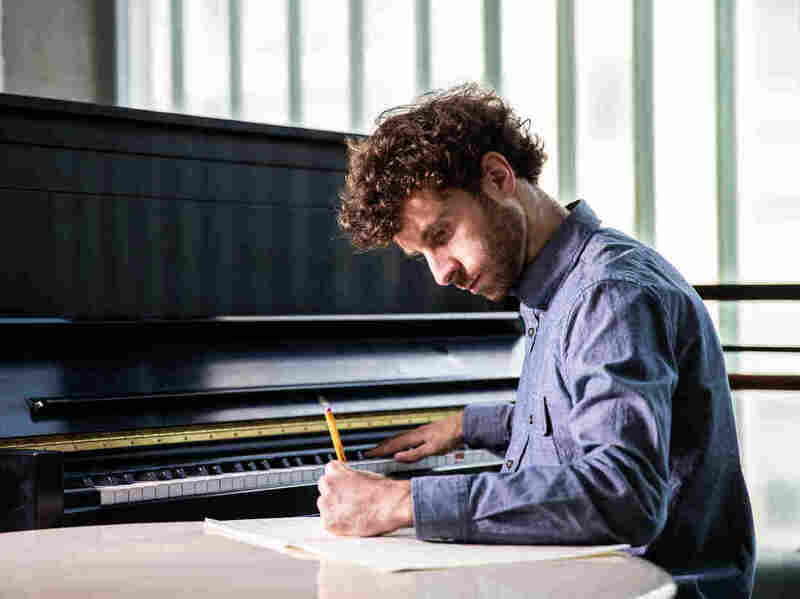 MacArthur Fellow Matthew Aucoin Talks Composing And Donating His 'Genius' Money : Deceptive Cadence The 28-year-old polymath from Boston discusses his new award, his precocious youth and how he perceives all human language as a form of musical communication. Matthew Aucoin, 28, has been awarded a MacArthur "genius" grant for his work as a composer and conductor. Composer Matthew Aucoin has earned one of the most prestigious awards in the arts and sciences. Wednesday he was announced as a 2018 MacArthur Fellow, a recipient of the so-called "genius grant" from the MacArthur Foundation, which includes a $625,000 no-strings-attached purse. Aucoin, the youngest winner this year, joins 24 other Fellows, whose work spreads wide across the arts, humanities and sciences. Violinist Vijay Gupta, media scholar Lisa Parks and choreographer Okwui Okpokwasili are also among this year's recipients — read more about them here. Since 1981, nearly 1000 people have been awarded the MacArthur grant. Aucoin, 28, is a quadruple threat. By the age of 25 he was already winning praise as a composer, conductor, pianist and writer, prompting the New York Times to dub him "opera's great hope." Crossing, his 2015 opera set to his own text and based on the diaries of Walt Whitman's work as a Civil War nurse, was celebrated as a "taut, teeming and inspired work." But Aucoin was busy long before that. At age 10 he composed a short opera, complete with instructions for costumes and set design. Although he wonders why his precocious youth remains a hot topic, Aucoin is not opposed to recalling those early days, as he spoke by phone from his home in New York City. Tom Huizenga: Everyone seems to talk about how talented you were as a youngster. Matthew Aucoin: I should start by saying I have been a little perplexed in the past few years that that's been the attitude by so many people. I was not one of those insufferable kids soloing with the Chicago Symphony Orchestra at 10 years old. I think started to come into my own as an adult. But that said, I started composing privately when I was 6 years old and knew immediately that I wanted to be a composer. Do you remember that "aha" moment back then? I do. I heard Beethoven's Ninth [Symphony] playing somewhere — it could have been on the radio, could have been in a shopping mall — and it made the most overwhelming impression on me. I didn't have words for it at the time but I remember thinking something to the effect of: "How can something this beautiful exist? How could human beings have done that?" And it prompted me to wonder if I could explore that path myself. In the MacArthur Foundation's citation, there's a one-liner about you that reads: "Expanding the potential of vocal and orchestral music to convey emotional, dramatic, and literary meaning." How do you feel about that description? I think that description sounds like what I'm trying to do, but I don't believe I've done it yet. And that's why I'm grateful for the fellowship. It's really a gift of time to realize that goal. So yes, I am trying to deepen and expand the possibilities of our musical materials. But I would never claim that I've gotten anywhere near that point yet. For those who don't know your music yet – and hopefully this award will help remedy that — how would you describe it? I would call my music explosively tonal. My rhythmic language owes a lot to my background in jazz and playing in a rock band when I was in high school. There's a very American sense of groove or pulse in a lot of my music. But the harmonic language comes from somewhere else; it comes from the past century of classical music, everything from the Second Viennese School to John Adams. So it's a goulash and I hope it's tasty! I read that you hear music as language and vice versa. I think all human language is a form of musical communication. I communicate as much to you through my tone of voice and the cadence and the rhythm of what I'm saying. That communicates as much as the words do themselves, whether we believe what another person is saying, whether they're furious with us or whether they're telling us that they love us. These are all things that are encoded in the music of the language. As someone who also studied poetry, that feels really important. And understanding the weird, funky music of the English language, which is really unpredictable — sometimes it's very rough and sometimes it's very sticky. It has a lot more variety inside of it than the Romance languages. Understanding the music of American English feels really essential for understanding American music and the forms it has taken. The award comes with at least two things: an enormous amount of prestige, not least of which is because of the nickname, the "Genius Grants," and a pretty substantial amount of no-strings-attached cash. Any idea of how these two will affect your career? First it's a gift of time. I think time it's the most precious resource for a composer. Music is literally made of time. And it requires time and a certain serenity and space to be created. It actually feels like a wonderful responsibility to be able to go deep and make my music even more honest and deep and wild through this gift of time. But also I'm going to give a substantial chunk of this money away. I'm a big fan of the whole idea of effective altruism. For as long as anybody is starving in the world, we non-starving artists should be relatively far down the totem pole of who gets help. So I would feel seriously guilty keeping all of this money for myself and I won't do that. I think all human language is a form of musical communication. Tell us a little bit about what you are working on now, a new opera, right? I'm finished with the piano vocal score, but now comes the task of orchestration, which is a pretty time-consuming one. The opera is called Eurydice. It is a collaboration with a playwright Sarah Ruhl. Sarah wrote a play of that name and we're adapting it into an opera. It's this gorgeous play, written with a very light touch, which reimagines the Orpheus myth from Eurydice's perspective and very much in the 21st century. It'll have its world premiere at L.A. Opera next season and then it will come to the Metropolitan Opera in 2021. Keeping in mind that Charles Rosen quote where he says, "The death of classical music is perhaps its oldest continuing tradition," I'm wondering what your take is on classical music today. Is it in good shape? I think there is so much exciting music being made. And there are so many deeply talented performers making their way in the world. And personally, I'm okay with classical music being a niche. Do we really want the pressures of mainstream pop music? Do we really want the pressures of only being able to write three-and-a-half minute songs, or whatever? We've got so much freedom. And yes, we have a relatively small audience when you compare it to Justin Bieber, but this is music that requires deep engagement. And it also rewards deeply. And it's okay that it's not for everybody, but it's a refuge that is waiting for anybody who needs it. I think we should just keep our heads down, focused on making good music and trust that the listeners will find it.